In a blast furnace, fuel (coke), ores, and flux (limestone) are continuously supplied through the top of the furnace, while a hot blast of air (sometimes with oxygen enrichment) is blown into the lower section of the furnace through a series of pipes called tuyeres, so that the chemical reactions take place throughout the furnace as the material falls downward. The end products are usually molten metal and slag phases tapped from the bottom, and waste gases (flue gas) exiting from the top of the furnace. The downward flow of the ore and flux in contact with an upflow of hot, carbon monoxide-rich combustion gases is a countercurrent exchange and chemical reaction process. In contrast, air furnaces (such as reverberatory furnaces) are naturally aspirated, usually by the convection of hot gases in a chimney flue. According to this broad definition, bloomeries for iron, blowing houses for tin, and smelt mills for lead would be classified as blast furnaces. However, the term has usually been limited to those used for smelting iron ore to produce pig iron, an intermediate material used in the production of commercial iron and steel, and the shaft furnaces used in combination with sinter plants in base metals smelting. Cast iron has been found in China dating to the 5th century BC, but the earliest extant blast furnaces in China date to the 1st century AD and in the West from the High Middle Ages. They spread from the region around Namur in Wallonia (Belgium) in the late 15th century, being introduced to England in 1491. The fuel used in these was invariably charcoal. The successful substitution of coke for charcoal is widely attributed to English inventor Abraham Darby in 1709. The efficiency of the process was further enhanced by the practice of preheating the combustion air (hot blast), patented by Scottish inventor James Beaumont Neilson in 1828. Archaeological evidence shows that bloomeries appeared in China around 800 BC. 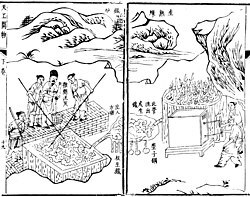 Originally it was thought that the Chinese started casting iron right from the beginning, but this theory has since been debunked by the discovery of 'more than ten' iron digging implements found in the tomb of Duke Jing of Qin (d. 537 BC), whose tomb is located in Fengxiang County, Shaanxi (a museum exists on the site today). There is however no evidence of the bloomery in China after the appearance of the blast furnace and cast iron. In China blast furnaces produced cast iron, which was then either converted into finished implements in a cupola furnace, or turned into wrought iron in a fining hearth. The effectiveness of the Chinese blast furnace was enhanced during this period by the engineer Du Shi (c. AD 31), who applied the power of waterwheels to piston-bellows in forging cast iron. Donald Wagner suggests that early blast furnace and cast iron production evolved from furnaces used to melt bronze. Certainly, though, iron was essential to military success by the time the State of Qin had unified China (221 BC). Usage of the blast and cupola furnace remained widespread during the Song and Tang Dynasties. By the 11th century, the Song Dynasty Chinese iron industry made a switch of resources from charcoal to coke in casting iron and steel, sparing thousands of acres of woodland from felling. This may have happened as early as the 4th century AD. The primary advantage of the early blast furnace was in large scale production and making iron implements more readily available to peasants. Cast iron is more brittle than wrought iron or steel, which required additional fining and then cementation or co-fusion to produce, but for menial activities such as farming it sufficed. By using the blast furnace, it was possible to produce larger quantities of tools such as ploughshares more efficiently than the bloomery. In areas where quality was important, such as warfare, wrought iron and steel were preferred. Nearly all Han period weapons are made of wrought iron or steel, with the exception of axe-heads, of which many are made of cast iron. Blast furnaces were also later used to produce gunpowder weapons such as cast iron bomb shells and cast iron cannons during the Song dynasty. The simplest forge, known as the Corsican, was used prior to the advent of Christianity. Examples of improved bloomeries are the Stückofen [fr] (sometimes called wolf-furnace) or the Catalan forge, which remained until the beginning of the 19th century. 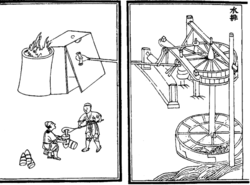 The Catalan forge was invented in Catalonia, Spain, during the 8th century. Instead of using natural draught, air was pumped in by a trompe, resulting in better quality iron and an increased capacity. This pumping of airstream in with bellows is known as cold blast, and it increases the fuel efficiency of the bloomery and improves yield. The Catalan forges can also be built bigger than natural draught bloomeries. 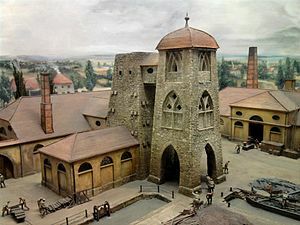 The oldest known blast furnaces in the West were built in Dürstel in Switzerland, the Märkische Sauerland in Germany, and at Lapphyttan in Sweden, where the complex was active between 1205 and 1300. At Noraskog in the Swedish parish of Järnboås, there have also been found traces of blast furnaces dated even earlier, possibly to around 1100. 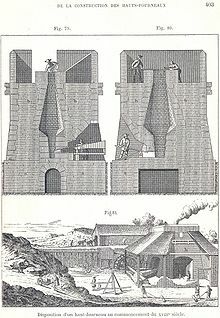 These early blast furnaces, like the Chinese examples, were very inefficient compared to those used today. The iron from the Lapphyttan complex was used to produce balls of wrought iron known as osmonds, and these were traded internationally – a possible reference occurs in a treaty with Novgorod from 1203 and several certain references in accounts of English customs from the 1250s and 1320s. Other furnaces of the 13th to 15th centuries have been identified in Westphalia. The technology required for blast furnaces may have either been transferred from China, or may have been an indigenous innovation. Al-Qazvini in the 13th century and other travellers subsequently noted an iron industry in the Alburz Mountains to the south of the Caspian Sea. This is close to the silk route, so that the use of technology derived from China is conceivable. Much later descriptions record blast furnaces about three metres high. As the Varangian Rus' people from Scandinavia traded with the Caspian (using their Volga trade route, it is possible that the technology reached Sweden by this means. High quality ores, water power for bellows for blast and wood for charcoal are readily obtainable in Sweden. However, since blast furnace technology was independently invented in Africa by the Haya people, it is more likely that the process was invented independently in Scandinavia. The step from bloomery to true blast furnace is not big. Simply just building a bigger furnace and using bigger bellows to increase the volume of the blast and hence the amount of oxygen leads inevitably into higher temperatures, bloom melting into liquid iron and, cast iron flowing from the smelters. Already the Vikings are known to have used double bellows, which greatly increases the volumetric flow of the blast. This Caspian region may also separately be the technological source for at furnace at Ferriere, described by Filarete. Water-powered bellows at Semogo [it] in northern Italy in 1226 in a two-stage process. In this, the molten iron was tapped twice a day into water thereby granulating it. One means by which certain technological advances were transmitted within Europe was a result of the General Chapter of the Cistercian monks. This may have included the blast furnace, as the Cistercians are known to have been skilled metallurgists. According to Jean Gimpel, their high level of industrial technology facilitated the diffusion of new techniques: "Every monastery had a model factory, often as large as the church and only several feet away, and waterpower drove the machinery of the various industries located on its floor." Iron ore deposits were often donated to the monks along with forges to extract the iron, and within time surpluses were being offered for sale. The Cistercians became the leading iron producers in Champagne, France, from the mid-13th century to the 17th century, also using the phosphate-rich slag from their furnaces as an agricultural fertilizer. Archaeologists are still discovering the extent of Cistercian technology. At Laskill, an outstation of Rievaulx Abbey and the only medieval blast furnace so far identified in Britain, the slag produced was low in iron content. Slag from other furnaces of the time contained a substantial concentration of iron, whereas Laskill is believed to have produced cast iron quite efficiently. Its date is not yet clear, but it probably did not survive until Henry VIII's Dissolution of the Monasteries in the late 1530s, as an agreement (immediately after that) concerning the "smythes" with the Earl of Rutland in 1541 refers to blooms. Nevertheless, the means by which the blast furnace spread in medieval Europe has not finally been determined. Due to the casting of cannon, the blast furnace came into widespread use in France in the mid 15th century. The direct ancestor of these used in France and England was in the Namur region in what is now Wallonia (Belgium). From there, they spread first to the Pays de Bray on the eastern boundary of Normandy and from there to the Weald of Sussex, where the first furnace (called Queenstock) in Buxted was built in about 1491, followed by one at Newbridge in Ashdown Forest in 1496. They remained few in number until about 1530 but many were built in the following decades in the Weald, where the iron industry perhaps reached its peak about 1590. Most of the pig iron from these furnaces was taken to finery forges for the production of bar iron. The first blast furnace in Russia opened in 1637 near Tula and was called the Gorodishche Works. The blast furnace spread from here to the central Russia and then finally to the Urals. Coke iron was initially only used for foundry work, making pots and other cast iron goods. Foundry work was a minor branch of the industry, but Darby's son built a new furnace at nearby Horsehay, and began to supply the owners of finery forges with coke pig iron for the production of bar iron. Coke pig iron was by this time cheaper to produce than charcoal pig iron. The use of a coal-derived fuel in the iron industry was a key factor in the British Industrial Revolution. Darby's original blast furnace has been archaeologically excavated and can be seen in situ at Coalbrookdale, part of the Ironbridge Gorge Museums. Cast iron from the furnace was used to make girders for the world's first iron bridge in 1779. The Iron Bridge crosses the River Severn at Coalbrookdale and remains in use for pedestrians. The steam engine was applied to power blast air, overcoming a shortage of water power in areas where coal and iron ore were located. The cast iron blowing cylinder was developed in 1768 to replace the leather bellows, which wore out quickly. The steam engine and cast iron blowing cylinder led to a large increase in British iron production in the late 18th century. Hot Blast was the single most important advance in fuel efficiency of the blast furnace and was one of the most important technologies developed during the Industrial Revolution. Hot blast was patented by James Beaumont Neilson at Wilsontown Ironworks in Scotland in 1828. 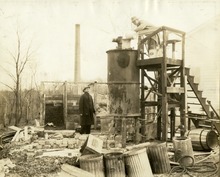 Within a few years of the introduction, hot blast was developed to the point where fuel consumption was cut by one-third using coke or two-thirds using coal, while furnace capacity was also significantly increased. Within a few decades, the practice was to have a "stove" as large as the furnace next to it into which the waste gas (containing CO) from the furnace was directed and burnt. The resultant heat was used to preheat the air blown into the furnace. Hot blast enabled the use of raw anthracite coal, which was difficult to light, to the blast furnace. Anthracite was first tried successfully by George Crane at Ynyscedwyn Ironworks in south Wales in 1837. It was taken up in America by the Lehigh Crane Iron Company at Catasauqua, Pennsylvania, in 1839. Anthracite use declined when very high capacity blast furnaces requiring coke were built in the 1870s. This is a great increase from the typical 18th-century furnaces, which averaged about 360 tonnes (350 long tons; 400 short tons) per year. Variations of the blast furnace, such as the Swedish electric blast furnace, have been developed in countries which have no native coal resources. Blast furnaces are currently rarely used in copper smelting, but modern lead smelting blast furnaces are much shorter than iron blast furnaces and are rectangular in shape. The overall shaft height is around 5 to 6 m. Modern lead blast furnaces are constructed using water-cooled steel or copper jackets for the walls, and have no refractory linings in the side walls. The base of the furnace is a hearth of refractory material (bricks or castable refractory). Lead blast furnaces are often open-topped rather than having the charging bell used in iron blast furnaces. The blast furnace used at the Nyrstar Port Pirie lead smelter differs from most other lead blast furnaces in that it has a double row of tuyeres rather than the single row normally used. The lower shaft of the furnace has a chair shape with the lower part of the shaft being narrower than the upper. The lower row of tuyeres being located in the narrow part of the shaft. This allows the upper part of the shaft to be wider than the standard. The blast furnaces used in the Imperial Smelting Process ("ISP") were developed from the standard lead blast furnace, but are fully sealed. This is because the zinc produced by these furnaces is recovered as metal from the vapor phase, and the presence of oxygen in the off-gas would result in the formation of zinc oxide. Blast furnaces used in the ISP have a more intense operation than standard lead blast furnaces, with higher air blast rates per m2 of hearth area and a higher coke consumption. Zinc production with the ISP is more expensive than with electrolytic zinc plants, so several smelters operating this technology have closed in recent years. However, ISP furnaces have the advantage of being able to treat zinc concentrates containing higher levels of lead than can electrolytic zinc plants. Modern furnaces are equipped with an array of supporting facilities to increase efficiency, such as ore storage yards where barges are unloaded. The raw materials are transferred to the stockhouse complex by ore bridges, or rail hoppers and ore transfer cars. Rail-mounted scale cars or computer controlled weight hoppers weigh out the various raw materials to yield the desired hot metal and slag chemistry. The raw materials are brought to the top of the blast furnace via a skip car powered by winches or conveyor belts. There are different ways in which the raw materials are charged into the blast furnace. Some blast furnaces use a "double bell" system where two "bells" are used to control the entry of raw material into the blast furnace. The purpose of the two bells is to minimize the loss of hot gases in the blast furnace. First, the raw materials are emptied into the upper or small bell which then opens to empty the charge into the large bell. The small bell then closes, to seal the blast furnace, while the large bell rotates to provide specific distribution of materials before dispensing the charge into the blast furnace. A more recent design is to use a "bell-less" system. These systems use multiple hoppers to contain each raw material, which is then discharged into the blast furnace through valves. These valves are more accurate at controlling how much of each constituent is added, as compared to the skip or conveyor system, thereby increasing the efficiency of the furnace. Some of these bell-less systems also implement a discharge chute in the throat of the furnace (as with the Paul Wurth top) in order to precisely control where the charge is placed. The iron making blast furnace itself is built in the form of a tall structure, lined with refractory brick, and profiled to allow for expansion of the charged materials as they heat during their descent, and subsequent reduction in size as melting starts to occur. Coke, limestone flux, and iron ore (iron oxide) are charged into the top of the furnace in a precise filling order which helps control gas flow and the chemical reactions inside the furnace. Four "uptakes" allow the hot, dirty gas high in carbon monoxide content to exit the furnace throat, while "bleeder valves" protect the top of the furnace from sudden gas pressure surges. The coarse particles in the exhaust gas settle in the "dust catcher" and are dumped into a railroad car or truck for disposal, while the gas itself flows through a venturi scrubber and/or electrostatic precipitators and a gas cooler to reduce the temperature of the cleaned gas. The "casthouse" at the bottom half of the furnace contains the bustle pipe, water cooled copper tuyeres and the equipment for casting the liquid iron and slag. 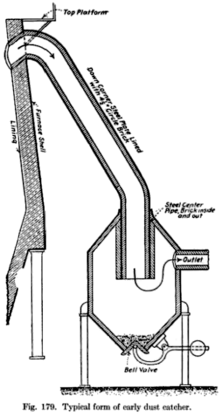 Once a "taphole" is drilled through the refractory clay plug, liquid iron and slag flow down a trough through a "skimmer" opening, separating the iron and slag. Modern, larger blast furnaces may have as many as four tapholes and two casthouses. Once the pig iron and slag has been tapped, the taphole is again plugged with refractory clay. The tuyeres are used to implement a hot blast, which is used to increase the efficiency of the blast furnace. The hot blast is directed into the furnace through water-cooled copper nozzles called tuyeres near the base. The hot blast temperature can be from 900 °C to 1300 °C (1600 °F to 2300 °F) depending on the stove design and condition. The temperatures they deal with may be 2000 °C to 2300 °C (3600 °F to 4200 °F). Oil, tar, natural gas, powdered coal and oxygen can also be injected into the furnace at tuyere level to combine with the coke to release additional energy and increase the percentage of reducing gases present which is necessary to increase productivity. Blast furnaces operate on the principle of chemical reduction whereby carbon monoxide, having a stronger affinity for the oxygen in iron ore than iron does, reduces the iron to its elemental form. Blast furnaces differ from bloomeries and reverberatory furnaces in that in a blast furnace, flue gas is in direct contact with the ore and iron, allowing carbon monoxide to diffuse into the ore and reduce the iron oxide to elemental iron mixed with carbon. The blast furnaces operates as a countercurrent exchange process whereas a bloomery does not. Another difference is that bloomeries operate as a batch process while blast furnaces operate continuously for long periods because they are difficult to start up and shut down. (See: Continuous production) Also, the carbon in pig iron lowers the melting point below that of steel or pure iron; in contrast, iron does not melt in a bloomery. Silica has to be removed from the pig iron. It reacts with calcium oxide (burned limestone) and forms a silicate which floats to the surface of the molten pig iron as "slag". Historically, to prevent contamination from sulfur, the best quality iron was produced with charcoal. The downward moving column of ore, flux, coke or charcoal and reaction products must be porous enough for the flue gas to pass through. This requires the coke or charcoal to be in large enough particles to be permeable, meaning there cannot be an excess of fine particles. Therefore, the coke must be strong enough so it will not be crushed by the weight of the material above it. Besides physical strength of the coke, it must also be low in sulfur, phosphorus, and ash. This necessitates the use of metallurgical coal, which is a premium grade due to its relative scarcity. The hot carbon monoxide is the reducing agent for the iron ore and reacts with the iron oxide to produce molten iron and carbon dioxide. Depending on the temperature in the different parts of the furnace (warmest at the bottom) the iron is reduced in several steps. At the top, where the temperature usually is in the range between 200 °C and 700 °C, the iron oxide is partially reduced to iron(II,III) oxide, Fe3O4. The "pig iron" produced by the blast furnace has a relatively high carbon content of around 4–5%, making it very brittle, and of limited immediate commercial use. Some pig iron is used to make cast iron. The majority of pig iron produced by blast furnaces undergoes further processing to reduce the carbon content and produce various grades of steel used for construction materials, automobiles, ships and machinery. Although the efficiency of blast furnaces is constantly evolving, the chemical process inside the blast furnace remains the same. According to the American Iron and Steel Institute: "Blast furnaces will survive into the next millennium because the larger, efficient furnaces can produce hot metal at costs competitive with other iron making technologies." One of the biggest drawbacks of the blast furnaces is the inevitable carbon dioxide production as iron is reduced from iron oxides by carbon and as of 2016, there is no economical substitute – steelmaking is one of the largest industrial contributors of the CO2 emissions in the world (see greenhouse gases). 2, while others choose decarbonizing iron and steel production, by turning to hydrogen, electricity and biomass. In the nearer term, a technology that incorporates CCS into the blast furnace process itself and is called the Top-Gas Recycling Blast Furnace is under development, with a scale-up to a commercial size blast furnace under way. The technology should be fully demonstrated by the end of the 2010s, in line with the timeline set, for example, by the EU to cut emissions significantly. Broad deployment could take place from 2020 on. Stone wool or rock wool is a spun mineral fibre used as an insulation product and in hydroponics. It is manufactured in a blast furnace fed with diabase rock which contains very low levels of metal oxides. The resultant slag is drawn off and spun to form the rock wool product. Very small amounts of metals are also produced which are an unwanted by-product and run to waste. For a long time, it was normal procedure for a decommissioned blast furnace to be demolished and either be replaced with a newer, improved one, or to have the entire site demolished to make room for follow-up use of the area. In recent decades, several countries have realized the value of blast furnaces as a part of their industrial history. Rather than being demolished, abandoned steel mills were turned into museums or integrated into multi-purpose parks. The largest number of preserved historic blast furnaces exists in Germany; other such sites exist in Spain, France, the Czech Republic, Japan, Luxembourg, Poland, Romania, Mexico, Russia and the United States. The blast furnace gas can be used to generate heat. So by reducing the constituents in blast furnace gas we can increase the calorific value and can be used to generate heat and rise the temperature in any furnace. The gas cleaning system contains two stages, the coarse cleaning system and the fine cleaning system. In the coarse cleaning system a dust catcher is used. A dust catcher is a cylindrical steel structure with conical top and bottom sections. It is also lined with refractory bricks. The principle of the dust catcher is that the dust-laden gas is given a sudden reverse in speed and direction. Because of their mass, the coarse dust particles cannot change their velocity easily, and hence settle to the bottom. Blast furnace in Sestao, Spain. The furnace itself is inside the central girderwork. Part of the gas cleaning system of a blast furnace in Monclova, Mexico. This one is about to be de-commissioned and replaced. Water gas, produced by a "steam blast"
Ironworks and steelworks in England, which covers ironworks of all kinds. ^ P J Wand, "Copper smelting at Electrolytic Refining and Smelting Company of Australia Ltd., Port Kembla, N.S.W. ", in: Mining and Metallurgical Practices in Australasia: The Sir Maurice Mawby Memorial Volume, Ed J T Woodcock (The Australasian Institute of Mining and Metallurgy: Melbourne, 1980) 335–340. ^ R J Sinclair, The Extractive Metallurgy of Lead (The Australasian Institute of Mining and Metallurgy: Melbourne, 2009), 9–12. ^ Simcoe, Charles R. "The Age Of Steel: Part II." Advanced Materials & Processes 172.4 (2014): 32-33. Academic Search Premier. ^ "The Earliest Use of Iron in China" by Donald B. Wagner in Metals in Antiquity, by Suzanne M. M. Young, A. Mark Pollard, Paul Budd and Robert A. Ixer (BAR International Series, 792), Oxford: Archaeopress, 1999, pp. 1–9. ^ Wagner 2008, p. 230. ^ Wagner 2008, p. 6. ^ The Coming of the Ages of Steel. Brill Archive. p. 54. GGKEY:DN6SZTCNQ3G. ^ Donald B. Wagner, 'Chinese blast furnaces from the 10th to the 14th century' Historical Metallurgy 37(1) (2003), 25–37; originally published in West Asian Science, Technology, and Medicine 18 (2001), 41–74. ^ Wagner 2008, p. 169. ^ Wagner 2008, p. 1. ^ Julius H. Strassburger (1969). Blast Furnace-theory and Practice. Gordon and Breach Science Publishers. p. 4. ISBN 978-0-677-10420-1. Retrieved 12 July 2012. ^ Douglas Alan Fisher, Excerpt from The Epic of Steel Archived 25 February 2007 at the Wayback Machine, Davis Town Museum & Harper & Row, NY 1963. ^ N. Bjökenstam, 'The Blast Furnace in Europe during the Middle Ages: part of a new system for producing wrought iron' in G. Magnusson, The Importance of Ironmaking: Technological Innovation and Social Change I (Jernkontoret, Stockholm 1995), 143–53 and other papers in the same volume. ^ "Adventures in Early Iron Production - An overview of experimental iron smelts, 2001 - 2005, by Darrell Markewitz. Bloomery iron furnaces of the Viking Age, experimental archaeology wrought iron production". www.warehamforge.ca. Archived from the original on 22 September 2015. ^ B. G. Awty, 'The blast funace in the Renaissance period: haut fournau or fonderie ', Transactions of Newcomen Society 61 (1989–90). 67. ^ a b Woods, p. 37. ^ R. W. Vernon, G. McDonnell and A. Schmidt (1998). "An integrated geophysical and analytical appraisal of early iron-working: three case studies". Historical Metallurgy. 32 (2): 72–5, &nbsp, 79. ^ David Derbyshire, 'Henry "Stamped Out Industrial Revolution"' Archived 13 June 2014 at the Wayback Machine, The Daily Telegraph (21 June 2002); cited by Woods. ^ a b c Tylecote, R. F. (1992). A History of Metallurgy, Second Edition. London: Maney Publishing, for the Institute of Materials. ISBN 978-0901462886. ^ B. Awty & C. Whittick (with P. Combes), 'The Lordship of Canterbury, iron-founding at Buxted, and the continental antecedents of cannon-founding in the Weald' Sussex Archaeological Collections 140 (2004 for 2002), pp. 71–81. ^ P. W. King, 'The production and consumption of iron in early modern England and Wales' Economic History Review LVIII(1), 1–33; G. Hammersley, 'The charcoal iron industry and its fuel 1540–1750' Economic History Review Ser. II, XXVI (1973), pp. 593–613. ^ Landes, David. S. (1969). The Unbound Prometheus: Technological Change and Industrial Development in Western Europe from 1750 to the Present. Cambridge, New York: Press Syndicate of the University of Cambridge. pp. 90–93. ISBN 0-521-09418-6. ^ Rosen, William (2012). The Most Powerful Idea in the World: A Story of Steam, Industry and Invention. University Of Chicago Press. p. 149. ISBN 978-0226726342. ^ McNeil, Ian (1990). An Encyclopedia of the History of Technology. London: Routledge. ISBN 0415147921. ^ "Coke for Blast Furnace Ironmaking". steel.org. Archived from the original on 8 February 2017. ^ Landes, David. S. (1969). The Unbound Prometheus: Technological Change and Industrial Development in Western Europe from 1750 to the Present. Cambridge, New York: Press Syndicate of the University of Cambridge. p. 92. ISBN 0-521-09418-6. ^ a b c R J Sinclair, The Extractive Metallurgy of Lead (The Australasian Institute of Mining and Metallurgy: Melbourne, 2009), 75. ^ a b c d e R J Sinclair, The Extractive Metallurgy of Lead (The Australasian Institute of Mining and Metallurgy: Melbourne, 2009), 77. ^ R J Sinclair, The Extractive Metallurgy of Lead (The Australasian Institute of Mining and Metallurgy: Melbourne, 2009), 76. ^ a b c d R J Sinclair, The Extractive Metallurgy of Lead (The Australasian Institute of Mining and Metallurgy: Melbourne, 2009), 89. ^ R J Sinclair, The Extractive Metallurgy of Lead (The Australasian Institute of Mining and Metallurgy: Melbourne, 2009), 90. ^ a b c d e American Iron and Steel Institute (2005). How a Blast Furnace Works. steel.org. ^ a b "Blast Furnace". Science Aid. Archived from the original on 17 December 2007. Retrieved 30 December 2007. Wikimedia Commons has media related to Blast furnace.